Includes (4) brackets, pull-up bar not included. Includes (6) brackets, pull-up bar not included. Uniquely designed for a sturdy ceiling mount or wall mount, the Rogue P-5V Garage Pull-Up System’s 1x2” 11-Gauge Steel brackets can be customized to virtually any training space. Like the P-3 system, the P-5V brackets measure 24x23” inches with pull-up bar slots at both 14” and 22” from the mounting point. With the P-5V, however, the support arm is positioned at the center of the mounting tube, making it more conducive for ceiling mounting in some instances. The P-5V Garage Pull-Up System can be anchored to any stable wood stud/ceiling joist or concrete wall at the height of your choosing. For larger gyms, multiple brackets can also be daisy-chained together—separated by a few feet-- to create more pull-up stations while optimizing both space and materials. Available in bracket pairs or as a complete system with a 52” pull-up bar, the P-5V Garage Pull-Up System is a durable, practical, and expandable option for a garage gym or full-scale weight training facility. See the Full Line of Rogue Single-Unit Pull-Up Systems. Multiple brackets can be used in a row for limitless options. 1” steel tubing or 1.25” outer diameter steel pipe can be purchased locally at a hardware store or metal supplier and run through a daisy chained line of P-5V brackets. Rogue Pull-Up Rig Assemblies are Guaranteed Against Failure when Properly Installed. Rogue P-5V Garage Pull-Up System is rated 4.8 out of 5 by 59. Rated 5 out of 5 by BikeOrDie from Excellent bar I chose this bar over the 6 based on height for a ceiling mount. I use the lower height of the two on my near 9 ft ceiling in garage and works perfectly as I can't reach the floor. I'm 6'3" 205# and have no concerns hoping up and hanging. It doesn't say online or in reviews the suggested hardware. It is 4.5" 3/8ths lag bolts. I got those with washers at Home Depot for $7 and it's solid. Used stud finder and marked holes with pencil and worked fine installing myself. I'm not very handy but have a ladder, stud finder, and drill. A little work holding the supports while the lag bolts get tightened, but if you're getting a pull-up bar, you should be able to handle. I'm already thinking about getting rings after a few days of having installed so I can do dips and rows. Solid construction and good grip on bar without chalk. Supplements my couple time weekly visits to the gym and builds calluses quite well. First Rogue purchase, but will do more now! Rated 5 out of 5 by Jake McCoy from Sturdy and worth the extra money This pullup bar is priced higher than other bars out there. It is worth the extra money if you value a bar that is rock solid and over-engineered. You cannot tell from pics, but the steel on this bar system is super thick. The steel gauge is in the description. However, other bars out there don’t mention their steel gauge. Just realize this is probably the most substantial steel on the market. I have mine mounted on the ceiling. There is absolutely no movement whatsoever. Also, the way the cross bar sits in the brackets makes it easy to change the height position of the bar if so desired. In some other bars out there, you have to loosen the brackets at the ceiling in order to get the bar out. Rated 5 out of 5 by rcincorporated from Basic and Perfect I have this bad boy in my garage. My kids, my wife, and I swing on it daily!! I'm 210lbs. Solid workmanship with NO issues. Rated 5 out of 5 by JH25 from Perfect , solid , looks great too Easily mounted in to cathedral ceiling joists . Plenty of room to do levers or any kind of pull-up you can image. Looks great and solid as a rock . It's the center piece of the home gym now . Could not ask for better. Rated 5 out of 5 by cftjim from Perfect for a garage My teens outgrew the doorframe bar, so it was time for a "real" bar. Did a bit of homework, measured up the garage, and bought this one to hang from ceiling. It's working out perfectly with the Rogue box and rings. So far we've done plenty of kipping and strict pullups, toes-to-bar, ring dips, and so on. Solid as a rock for two teens and a 225lb adult. Rated 5 out of 5 by Corbino from Solid pull up system Awesome pull up system. Very strong and nice looking too. 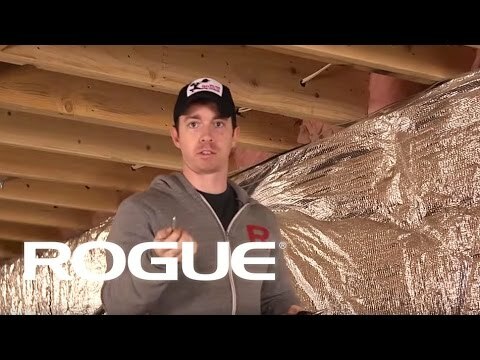 I just installed in my home gym which is an old out-building with studs at 24" on center. It's solid as a rock. Mounted it up using 4" 3/4 lag screws and 3/4 washers. I ran a 3/4" diameter steel pipe through for a pull up bar, you can use any width of pipe and tighten with the small bolts to hold it in place.